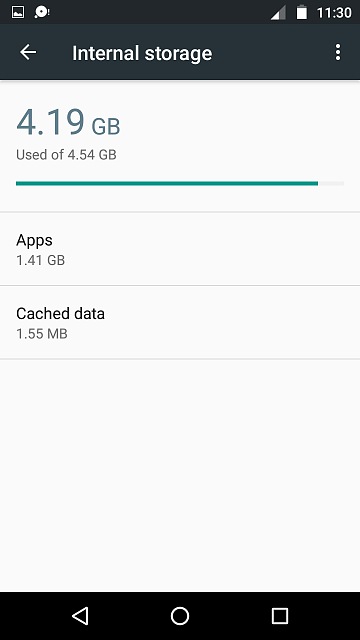 Why is my storage so full when I have almost no apps? What the heck is taking up the other ~3 GB in my internal storage, if the OS is already accounted for? OS takes up (as shown above) 3.46GB alone, plus 1.41GB worth of apps... that's pretty much the 4.2GB that your internal storage usage is showing. Phone storage is partitioned (like a PC with one hard drive that has 2 "drives" - C and D). But there are many partitions - bootloader, recovery, system, userdata - and it's only that last one that you have access to. Some manufacturers take as little space for everything else as they can and leave as much as possible for userdata. But some take more for other partitions (who knows why? I don't work for any of them), so userdata is smaller. It looks like your userdata partition is 4.54GB, so that's all you get. 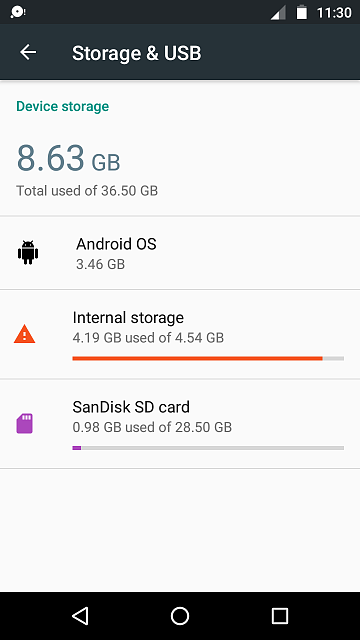 Android OS takes up 3.46GB. But you don't see Linux listed there, and it's on your phone too. (Android OS is a program not an operating system - it runs on a Linux operating system.) The recovery partition isn't listed there. The bootloader partition isn't listed there. Phones are rated by the total amount of internal storage, so a 16GB phone has a total of 16GB. But the recovery and bootloader partitions take part of that, Linux sits in part of that, there's a boot partition. In newer phones, there are 2 system partitions, a and b. (The system gets updated to the one not currently in use. If the update worked, the phone switches to it. But if it dodn't work, you don't get a bricked phone, you just stay on the last update. Great idea [finally - I've been asking for it since Cupcake] but it costs storage.) So what you see, in an Android phone, is not what you get. So newer phones (for example, a 2015 Moto G3?) basically reserve enough space for the OS in an inaccessible partition? (Sorry if that seems obvious by your answer - just trying to clarify; I'm a little new to paying much attention to things like this). All phones do. Your Internal Memory (as listed) is never the AVAILABLE memory. There will always be a part (in newer versions of Android, about 3.5GB give or take) that's being already taken up by Android. Newer phones actually reserve two copies of space for the system - and two copies of the space for the vendor (manufacturer+carrier) junk. That "36.5GB" you see is what's called 32GB (it's actually 36.5gB - notice the case - 1gB = 1,000*1,000*1,000 bytes. 1GB = 1,024*1,024*1,024 bytes. The 3.64 is not included in the 4.54, but it is included in the "32GB" of the phone.